... we had one last stop before leaving Yazd; the town’s centuries old main mosque. 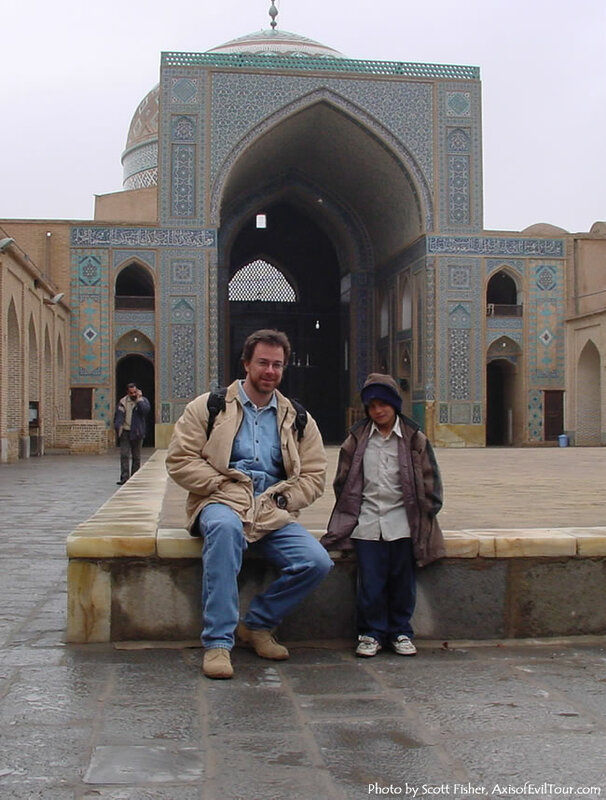 After a while touring mosques in the Middle East becomes like touring cathedrals in Europe; boring. At this one though we came upon a little Afghani kid who volunteered to lead us on a tour through the winding traditional alleys of the city. We readily agreed, abandoned the mosque, and took off after the little guy. Professor got him talking and found out he was here with his father who’d come into Iran looking for work. He was a day laborer on some nearby construction site – leaving his seven or eight year old son alone most of the day to fend for himself. The kid had made good use of his time though. Only in-country for a few months he already spoke Farsi nearly fluently. Professor had little problem talking to him. The little kid was fascinated by me, more specifically, by my size. I’m by no means a huge man, especially by American standards, but in Asia (outside Russia anyway) anyone over six feet usually gets a decent amount of attention. He kept asking Professor to translate questions asking how tall I was, how much I weighed, and, once he noticed my boots, how big my feet were.